The Faux Fur Leopard Print trend was a big hit a few years ago, and I was obsessed. I remember constantly wearing my leopard print clutch in almost every blog post and I even created a holiday outfit with leopard print. Remember this holiday leopard outfit back in the day? Head to toe because I just loved it that much! The one thing I was missing a few years ago to fulfill my leopard print obsession was the faux fur leopard print vest. I wanted one so badly! Well people, I am so glad it made a comeback and I’m loving it even more. And for Christmas, can you guess what I received? You got it, a faux fur leopard print vest! It is so cozy, warm, and chic! Since I got it for Christmas (and it was selling out like hot cakes), I believe it keeps going in and out of stock. I found the exact vest on eBay and the price it is selling at is the same at J.Crew, which I was surprised by. I am currently wearing a size small and it is the perfect fit. If I went a size up, I think it would be too chunky for my frame. I couldn’t resist wearing my all time favorite Madewell sweater. I wore the green one during the Fall and for Christmas I asked to receive the same sweater in multiple colors. The one I am wearing is in ‘heather prsm’ color. I also got it in ‘hther blossom‘. Overall, I’m just a sucker for Madewell sweaters haha. I do want to get some more faux fur leopard print pieces. 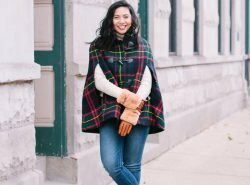 My favorite bloggers are rocking the coat, and it looks like the perfect thing to wear to look winter chic! Anyways. below are my other favorite leopard print pieces. Most are under $100! Yay! What are your thoughts on this trend? Do you own any leopard print pieces? I love this too! You’re such a cutie! I love this trend too! OBSESSED with your vest! So cute! You would totally wear this vest so well! I saw this vest in store and loved it. 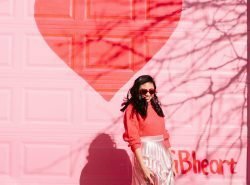 So cute the way you styled it here! Isn’t it cute! So glad I finally got it! It is such a fun print! I love anything leopard print. Super cute vest and love the boots!! that vest is so fun! great outfit! I love faux fur so much and especially leopard print ! Glad you love it too Margot! Its not the trend for me (haha) but you do look wonderful in it! This vest is major! Love the leopard print as well! So chic, Rach!! Love your faux fur vest, great look! It’s so crazy because I used to own a few faux fur pieces and now I don’t have any. But I really like it in faux fur vest form. So cute! What!? I totally would have thought you would have some. I LOVE IT TOO! Looks so cute on you and great with the gray! Glad you love it too Andrea! AHH I love this – it’s just the right amount of leopard! The vest is super cute and looks so cozy! I love leopard print, I have a coat which I adore. Omg I saw your coat and it is gorgeous! I love the leopard trend. I feel if you add anything in this print your outfit becomes chic in seconds. I am so with ya girl! I do love this faux fur leopard print pieces ! This vest is absolutely chic and I love that you paired it with neutral colors to avoid so much going on in your look. Love the bag too! In love with this look babe!! Adoro tu chaleco, es monísimoo y el look te ha quedado genial. YAAS it is making a comeback and I am loving it as well!! Love this vest. You wear it so well too, girl! Love the added illusion of texture this print gives. I am loving it on you! So chic lady! And looks so cozy. Gorgeous! I just love this look! Faux fur is so fun and versatile, it’s such a great wardrobe piece. I’m obsessed with your bag! Love the faux fur jacket too! Thanks Danasia! It is a new bag of mine and I’m loving it too! I am alllll about leopard print. It is such a fun neutral to spice up a look. Love your vest. Isn’t it a great print?! Thanks Annette! 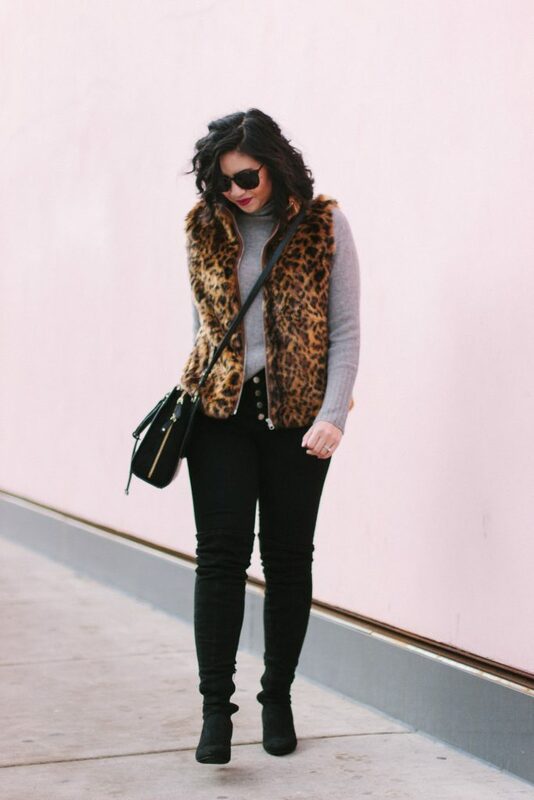 You combined two of my favorite things in this outfit: faux fur and leopard print! It doesn’t get much better than this! Love! This is SUCH a good look on you! Love it! 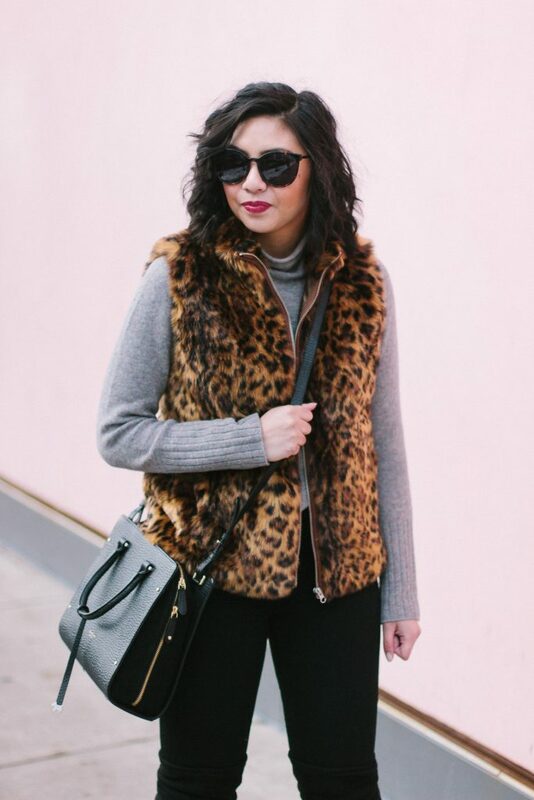 I can see leopard print everywhere and this faux fur looks so chic paired with the total outfit. I am loving this trend as well!! 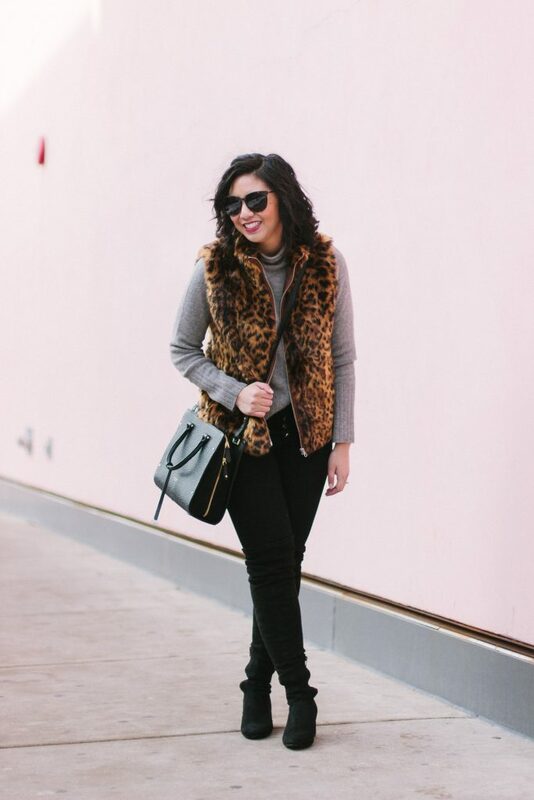 This leopard vest is so cute on you! Thank you so much Tina!! I am always pinning your stuff haha! Oh these are absolutely adorable! I love the Leopard Print style, simple and at the same time stylish! SUCH a good vest!! I love the leopard and am definitely going to be getting one! 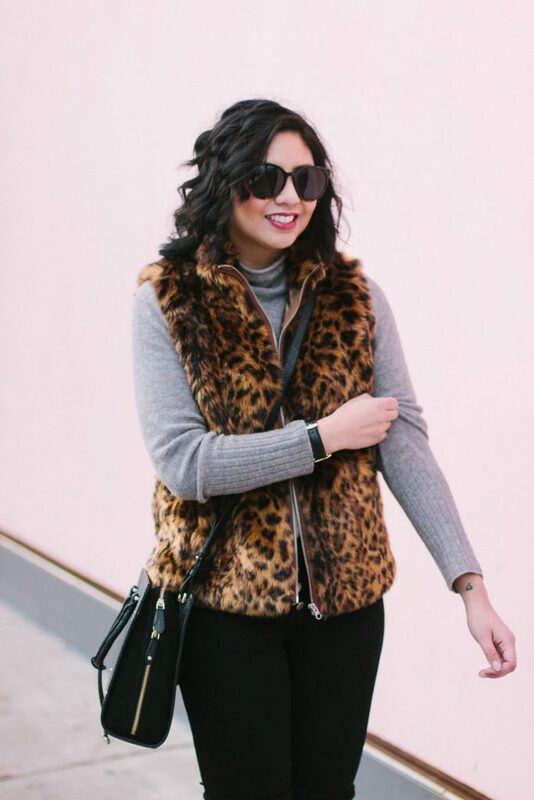 Love how you’ve styled the Faux Fur vest! Red lips sealed the look!! YES to it making a comeback!!! Bold and easy staple piece to have!!! Thank you! I love that it is making a comeback too! Cute! I am loving this trend too! I would wear faux fur regardless!